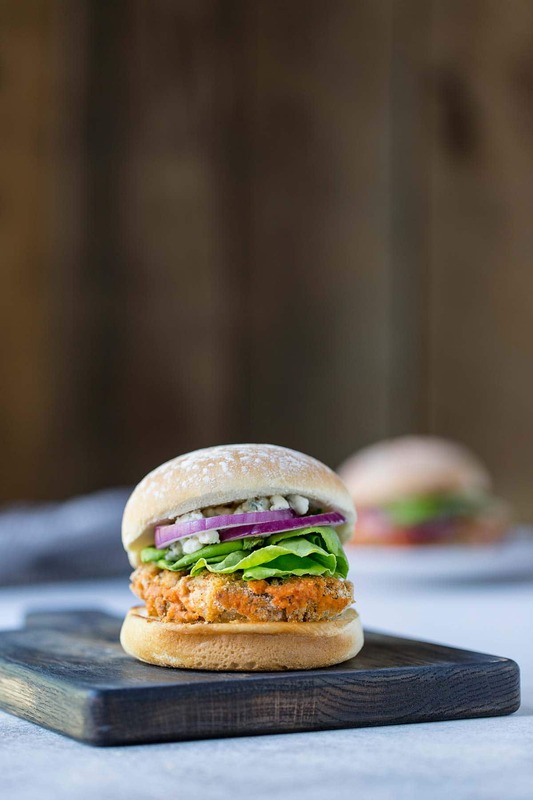 This spicy, tangy buffalo chicken sandwich recipe will win over anyone who loves buffalo wings! Boneless skinless chicken thighs keep the sandwich tender and juicy, while breadcrumbs bring a nice crunch without the deep fry. This post is a paid collaboration with Sara Lee Bread®, who I’ve teamed up with to showcase their new Artesano™ Bakery Buns. When it comes to chicken wings, I’m a bit of an oddball. I tend to shy away from the traditional buffalo sauce flavor, instead going for options like my sesame hoisin or honey garlic wings. This is regardless of whether I’m cooking from scratch or dining out. However, I actually love the way hot sauce pairs with chicken, so I’m always looking for new ways to combine the two ingredients. 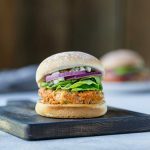 When Sara Lee Bread® reached out to me about collaborating on a post to showcase their new Artesano™ Bakery Buns, my mind immediately went to buffalo chicken sandwiches. How great for summer, right? I thought these buns worked perfectly with the sandwiches. They have a soft, delicate texture that reminds me of potato buns, are a good size, and they hold their shape very well. These are an excellent choice for grilled burgers and a variety of other summer sandwiches. I also got to sample their Artesano™ Bakery Rolls, which are a perfect size for sliders. Visit the Sara Lee Bread® website for more information about their products! I tried this sandwich using both regular and panko breadcrumbs. These photos show the regular breadcrumbs, but I ultimately preferred the panko version. While it looked very similar, it had more texture. You can substitute Italian-style breadcrumbs for some additional seasoning. This type of breadcrumb typically includes salt and pepper, so eliminate those from the recipe if you make the substitution. Any type of large skillet will work with this recipe; use what you have. Nonstick might require less oil than I’ve listed in the ingredients, but you’ll get less browning on the chicken (which means a bit less flavor). A seasoned cast iron skillet is an excellent choice if you have one. Stainless steel will yield a crispy brown sandwich but may require additional oil. You can substitute boneless, skinless chicken breasts if you’re trying to cut down the calories and fat, but the sandwich won’t be quite as tender and juicy. I recommend using 2 chicken breasts, pounded thin and sliced in half crosswise (for 4 pieces total). 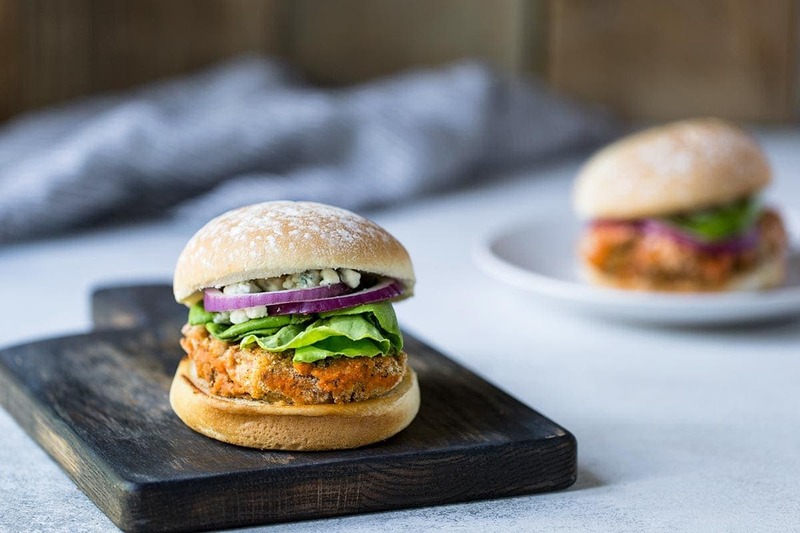 This tangy, spicy buffalo chicken sandwich recipe is pan fried for maximum flavor with less oil. If you love buffalo wings, you will love this sandwich! Pat the chicken dry using paper towels. Place on a large cutting board and cover with plastic wrap, then use a meat mallet or rolling pin to slightly thin out the chicken thighs. Alternately, you can place the thighs in a large resealable bag before pounding them thin. Create a dredging station: Set out 3 medium-sized bowls or shallow dishes plus a large plate for the dredged pieces. In the first bowl, combine the flour, salt and pepper. In the second bowl, whisk together the egg, 1 tablespoon sour cream, and 1/4 cup hot sauce. Place the breadcrumbs in the third bowl. One at a time, dip the thighs into the flour, shaking off the excess, then the egg mixture (again shaking off excess liquid), and finally, the breadcrumbs. Heat a large skillet over medium heat (see notes). Add oil to pan and swirl to coat. Add the chicken and cook for approximately 6 minutes per side, or until browned on the outside and an internal thermometer reads 165 degrees F. You can adjust the heat as needed or flip the chicken more than once if you feel it’s browning too quickly (or too slowly). Whisk together the remaining 1/4 cup sour cream and 2 tablespoons hot sauce in a small bowl. Optionally, you can briefly place the buns under the broiler to toast them (keep an eye on them). 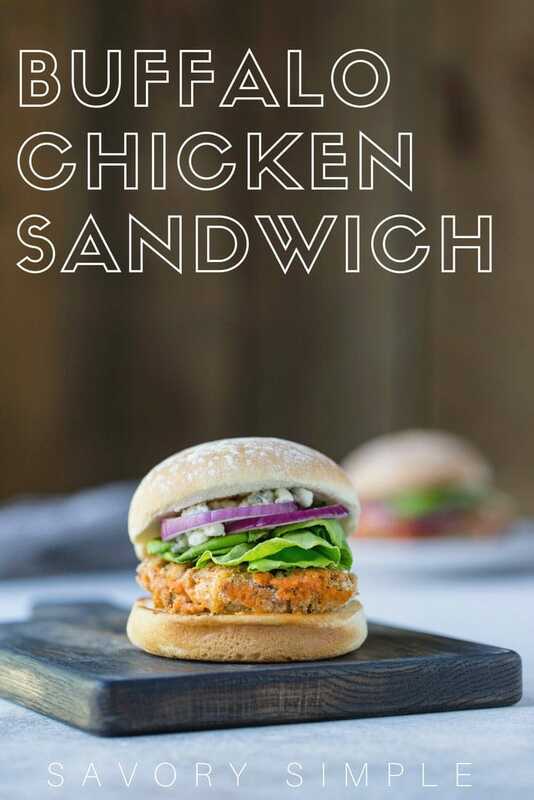 Build buffalo chicken sandwiches using the buns, chicken, prepared sauce, and optional toppings, if using. I tried this recipe using both regular and panko breadcrumbs. I ultimately preferred the panko version, which yielded a crispier sandwich. You can use any type of large skillet with this recipe. Nonstick might require less oil but you may get less browning on the chicken (which means less flavor). A seasoned cast iron skillet is a great overall choice if you have one. Stainless steel will yield a nice, crispy brown sandwich but may require additional oil. Anything buffalo chicken and everyone in my family is in! These would be a big hit! The perfect lunch! Love ANYTHING buffalo chicken! I love the sound of this sandwich!! My husband would especially like this – he loves anything spicy and buffalo! This is a must make burger! Love those buffalo flavors! This looks amazing! Can’t wait to try this recipe! While I’m not a fan of buffalo wings, my family is and they loved these! Easy for me to make ahead for a quick lunch or dinner meal! Our 11 year old son loves anything buffalo, so he would go crazy for this!